Extreame Savings Item! Save 41% on the [17x11inch]Fridge Board, Newjinda Magnetic Dry Erase Sheet for Refrigerator[Strong Magnetic], [Many Magnetic Parts] Includes 5 Markers, Magnetic Dry Erase, 2 Magnets, Whiteboard for Planner Calendar by Newjinda at Community Frontiers. MPN: 9. Hurry! Limited time offer. Offer valid only while supplies last. FINALLY A FRIDGE WHITEBOARD TO COVER ALL YOUR NEEDS! Reinvented Stain Resistant Surface - The Largest Size 17x11'' - High-Quality Dry Erase Board. FINALLY A FRIDGE WHITEBOARD TO COVER ALL YOUR NEEDS! Reinvented Stain Resistant Surface - The Largest Size 17x11" - High-Quality Dry Erase Board. The Reasons Why Our Whiteboard Is the One for You! 1. NEW PROPRIETARY STAIN RESISTANT TECHNOLOGY: Our proprietary technology ensure that you can easily wipe away any writing made with dry erase markers for up to 45 days without leaving stains or ghosting images behind. 2.The most standard (17x11 in) size on the market! 3.Our incredible whiteboard sheet is 0.3 mm thick so you know it's durable, strongly magnetic and efficient! 4.The white board has been successfully tested for 100.000 write-erase cycles. 6.Inspiration Can Strike Anywhere! Be Prepared! Students or people working in the office will find our Whiteboard with magnetic back really handy, since they can have multiple writing surfaces and can easily take notes, wherever they are! 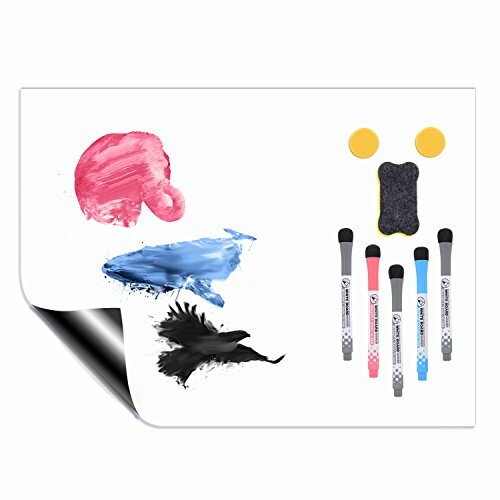 [Lots of Strong Magnetic Accessories Included]: The refrigerator board come with 5 colorful fine tip dry erase markers,2 Magnetic photo holder and 1 separate small eraser.Everything is magnetic so they'll always be right next the board when you want to use them. There is no way to lose them! [Strong Magnetic to Stick]: Fridge whiteboard with strong magnetic to stick any flat or curved magnetic surface without sliding or falling like other boards. Be sure to test your fridge - some stainless steel fridges are not magnetic on the front door. If a regular magnet sticks to your fridge, this calendar will too. [Easy to Erase Clean]: Our refrigerator dry erase board that can be erased clean easily without any liquid, it don't like the other magnetic dry erase board which must be must be scrubbed relentlessly with liquid but still leave messy ghosting stains that haunt you every time you look at them! [Multipurpose Use]: Grocery list - To do list - Chore list- Shopping list - Drawing board - Office board - Daily menu planner - Calendar - Scheduler. [Warranty & Money Back]: If you have any issues at all with your magnetic white board, Please feel free to contact us for a free replacement or give you money back! If you have any questions about this product by Newjinda, contact us by completing and submitting the form below. If you are looking for a specif part number, please include it with your message.